New Wales manager Brian Flynn will travel to Ewood Park to watch Fulham against Blackburn, adding to rumours of a possible Simon Davies comeback. Davies is the only likely Welsh interest in Saturday's game, fuelling speculation the Fulham midfielder could make an international return. Flynn would not confirm that his trip was specifically to see Davies. But he has stated that his "door is open" to retired international players wanting to make Wales returns. Flynn's predecessor John Toshack saw a host of stars quit the international game and insisted to the end that it was their duty to push to play for their country, not his job to chase them. "Some people have asked me, would I go back and ask some players to come back if I had my time again and I've said never," said Toshack in his farewell news conference. "Maybe that's a fault of mine, but whether it's my pride or what, but I would never ever do that." Davies, Ryan Giggs, Robbie Savage, Danny Collins and Jason Koumas are among those former Wales stars currently outside the international game. "They are all excellent players, but we are looking to move forward now," said Flynn, who will be in charge for Wales' Euro 2012 qualifiers at home to Bulgaria and then in Switzerland next month. "They know my number, they know where I am and my door is always open. "If they want to speak to me, we will discuss it. I will speak with anyone." But Flynn, 54, harbours little hope of seeing Wales' greatest player Giggs returning to the international scene. "I think the decision regarding playing has been made by his [Manchester United] manager," said Flynn, speaking in Port Talbot in his first official media conference as Wales boss. "That has been well documented, so I can't see that happening in the near future. "I know Sir Alex [Ferguson] well enough to know that when he says no, he means no." 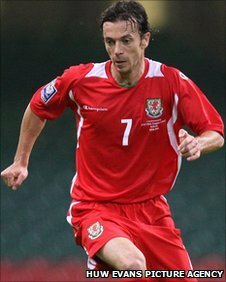 Haverfordwest's Davies, 30, won 58 caps for Wales, scoring six goals, after making his debut in 2001, but dramatically quit in the build-up to last month's friendly against Luxembourg in order to concentrate on club football. The former national captain was one of the senior Welsh players criticised following Wales' disappointing World Cup qualifying defeat to an average Finland side in Cardiff in March last year, a loss that made 2010 World Cup qualification virtually impossible. After the Switzerland clash on 12 October, the Football Association of Wales has five months to decide whether to confirm Flynn permanently in the post - assuming he wants the job full-time - or to appoint someone else.